Well well well. Almost a year to the day since I wrote my blog post about accidentally eating tripe in a cheese bar in Madrid, I’ve decided to get stuck back into the world of writing about cheese. I’ve obviously been eating cheese in the last year, but amongst a last minute house move and a new job (oh and being a bit lazy) I’ve not quite got round to the blog. So! I really liked this Manchego a lot. Probably the best I have had in the UK (though Spain is a whole different ball game). This firm sheep cheese was quite tangy and nutty, and also pretty strong – which kept me reaching for the cheese knife to cut more cheese! The taste doesn’t linger all that long so you are sort of left wanting more! It wasn’t so strong that it was overpowering – as in, you could keep eating it without really having to stop too much. I mentioned that I had the quince paste too. Quince paste is not really my area of expertise, this one was quite sweet and I didn’t have it will all the cheese I had as it would have been too much – plus, you really need to be able to enjoy the cheese by itself! But, in small doses it is great and I’ll be enjoying it with similar cheeses in future. The great thing about Manchego is that it can be enjoyed with so many different things. It isn’t really a common cheeseboard cheese (but I think it could be!) but works brilliantly as tapas, on the side with a Spanish omelette, with chorizo and other cured meats, or with a salad. If you do get some of it, try it out with different things to see what you like it with. I’m in the mood for more European cheeses I think, so I’ll try and write about another one soon! In the meantime, you can get this Manchego online, or pop into your nearest Waitrose. Happy cheese eating! I was in Spain last week and when I arrived in Madrid after a long train ride I was starving. The bright idea was to see if Spain’s capital had anywhere dedicated to eating cheese…it did. The Poncolet Cheese Bar. Brilliant I thought – Tripadvisor said they didn’t close for a siesta so going early evening to fill up on cheese and then get an early night after an early start seemed like an excellent idea. Anyway, after a bit of broken Spanish/English it turned out that their kitchen wasn’t open until later, but that I could eat from their bar menu. Fine by me – it’s still cheese right? So I go through their menu, clearly marked for allergies and such, and after a bit of google translate, which I still understand to be unreliable, the waiter came to take my order and I picked two of the options…it’s all cheese right? Google translate hadn’t really been helpful or so I thought…. Anyway at this point I was feeling pretty sick so gave it up and went back on to the delicious tartiflette….mmm yum. Finished that and realised I genuinely couldn’t eat any more of the “other dish”. So went back to Google translate…. turns out I’d eaten “tripe and nose….” if Google translate is accurate of course! I felt a bit sick. I still feel a bit sick…. So the moral of the story is….check your language skills before going into a restaurant full of your favourite food. Please. Luckily I laughed at the time and have laughed ever since so, please mock me relentlessly! Poncolet Cheese Bar itself is nice and I would go back (just not to eat tripe) – preferably when they have the full menu on! Anywhere that has its entire focus on cheese is well worth a visit if I’m honest, and would say to any of my cheese eating friends that they should head to Madrid if they are there. It’s at Calle de Jose Abascal, 61. Cornish Yarg – aka one of my favourite cheeses. Firstly sorry for the long break between posts…this was due to the pesky matter of a General Election getting in the way. I promise not to leave it so long next time! Down to business – this post is all about one of my favourite cheeses – Cornish Yarg. It isn’t very well known which is a real shame, as it is a good’un! For those of you who don’t know about it – it’s a semi hard cheese, wrapped in nettles, that hails from Cornwall (which is where I was born, might be something to do with why I like it so much!) It’s called Yarg because a Mr and Mrs Gray gave the recipe for the cheese to a dairy farm near Truro – and Yarg is simply Gray spelt backwards. Clever eh? The cheese itself is an absolute delight. I ate it over two sittings. The first time I didn’t eat with the nettle, and ate it with plain crackers. It’s got a really smooth texture but is obviously not a soft cheese, so feels a bit different to eat because it is a bit harder. It had warmed up a bit on the way home (thanks London summer!) which I now realise is the best way to eat it! It is a subtle, yet slightly tangy flavour, so it’s good for eating on it’s own – you know when you just want a bit of cheese and not much else? It’s great for those situations! So a few days later I was again in the mood for some cheese (and hadn’t done any food shopping – ha) so I pulled out the rest of the Yarg to finish it off and to try it a few different ways. First off I put it with some compote (posh compote that I bought a while ago) to see how that went. Do not eat Yarg with any type of chutney or compote. I’d thought that it is a cheese best eaten alone, and this proved my suspicion. Because it is a subtle and tangy flavour, there isn’t a whole lot that would really go with it well. So enjoy this one solo. So after I’d done the compote experiment, I decided to try it with the nettle still on. To be honest I’m not really sure if it’s meant to have the nettle on when you eat it or not, I don’t really care because it tastes good both ways! Because the nettle is so tangy it really contrasts with the smooth texture and subtle flavour of the cheese, eating the two together goes really, really well. It also creates a bit of a mouldy rind so you also sort of get your “cheese mould” fix if that’s what you’re after too. So I think in future I’ll probably go with this option. Without the chutney obviously. Yarg isn’t mass produced but you can find it at good Delis and I think places like Neal’s Yard. I used to buy Yarg from a tiny deli in Birmingham! I bought this Yarg from Sourced Market in Victoria and it cost £4.68 for 170g. 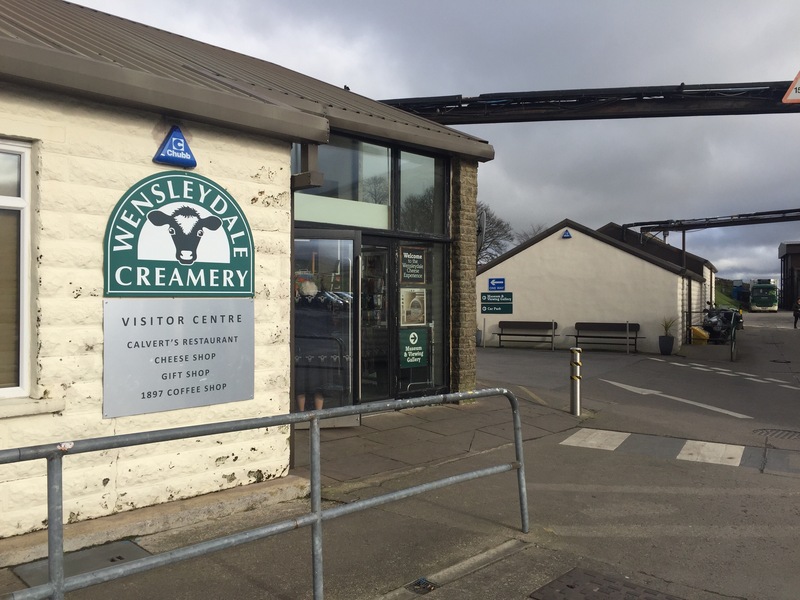 As you’ll have seen in my last post, I made the journey to the Wensleydale Creamery. One of the highlights of this was the shop at the end, where you could taste all of the cheese available to buy and make your choice. Sadly given the 5+ hour journey home I was a little limited on my cheese choice (not sure cheese whiff would add anything to a long Virgin Train journey to be honest). But back to the point. I decided to buy a Wensleydale Special Reserve cheese as it’s a bit different to normal Wensleydale, and I hadn’t heard of it before. The difference with normal Wensleydale is that it is matured for longer. Another cheese that I really liked. We all know that one of the features of a good Wensleydale is how crumbly it is – this one is even crumblier, and I think that’s to do with the longer maturing time. As you’d expect, it has a strong flavour (again, that must be due to the longer maturing time), which lingers and is quite tangy. The tanginess was unexpected but I liked it, and I kept eating it…once you pop you can’t stop etc. Mmmm, lovely, crumbly, tasty cheese. Because this has a strong flavour it works with chutneys – but be careful you don’t put too much on because you want to savour this strong flavour! The chutney I used also came from the Wensleydale Creamery – called the Yorkshire Wensleydale Chutney. This is nice and I’d recommend as a good pairing with any hard cheese with a strong flavour. You can buy both the cheese and the chutney online via the links provided. Wensleydale cheese has the “Protected Geographical Indication” status – the EU labelling that gives special status to food associated with a particular place, and only the cheese made at the Wensleydale creamery can use the EU label to identify it as the real deal. Without being asked, the guide in the museum said they had no idea what would happen to this post-Brexit. On that note – happy cheesing! I was up in Cumbria a few weeks ago staying with a friend. 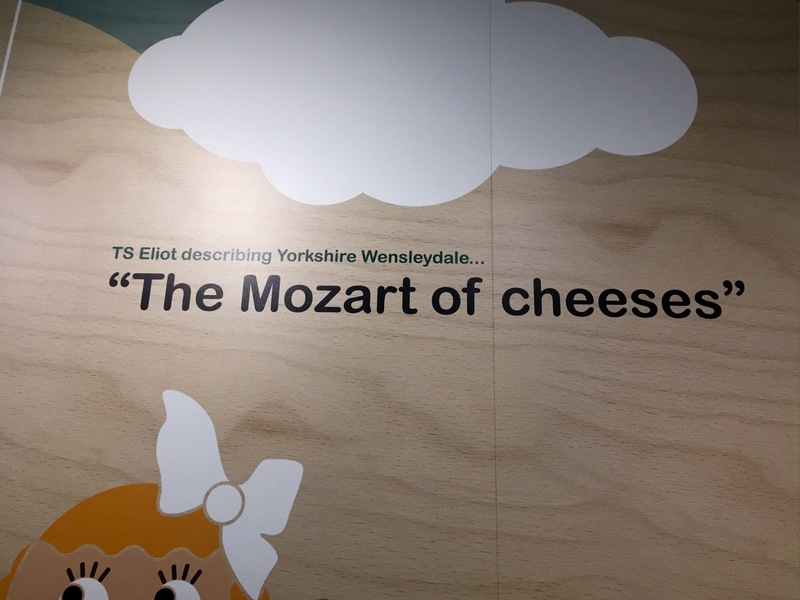 Naturally, the topic of conversation got on to cheese, and his parents suggested that we visit the Wensleydale Creamery, which is in Hawes in nearby North Yorkshire. So off we went! I really like Wensleydale – in its pure form, but also with cranberries. So understandably was pretty excited. My travel companion wasn’t so convinced (on the way there, at least). On first impressions it doesn’t look as though there’s much to see. But with a Visitor’s Centre, viewing area to watch the cheese being made, a shop, a cafe, a restaurant and a tasting area there is plenty to keep everyone occupied. We headed to the Visitor’s Centre first. It costs £2.50 to go in this part. You’ll get to see a full timeline of the history of cheese making in the area, how cheese is made, access to the viewing area (you look in on one part of the factory so you can see the action – though we went on a Sunday so it wasn’t working) and much more. We also got to see a cheese making demo by a very funny Yorkshireman – he essentially speeds up the process so you can’t eat it at the end, but it was very informative and amusing. Perhaps my favourite bit was tasting area – you could try all of their cheeses! Which of course, we did. It’s more of a try before you buy as they have plenty of each cheese to buy, as well as chutneys and crackers. They had the standard Wensleydale, a special reserve Wensleydale, the Wensleydale with cranberries, one with ginger, another with pineapple, it was quite something! I bought one cheese and some chutney, but that’s for another post! We didn’t go to the restaurant as it was fully booked but the food at least smelt good! The gift shop was full of cheese and Yorkshire themed products, so good for lovers of both of those things. I would really recommend visiting if you are in the area. It’s laid back, good value and full of cheese – what more could you want? Their address is Wensleydale Creamery, Gayle Lane, Hawes, Wensleydale, North Yorkshire, DL8 3RN. Their website is here. So, for my first cheese – a Sheep Rustler Order. No, I had no idea either what one of these was either. But the whole point of this blog is to try new cheeses, write about and then tell you about it. Broadening horizons etc. I got the cheese from Whole Foods – a bit fancy, but I was there anyway and thought I’d start the cheese tasting off in style. Anyway – down to serious business – what was the cheese like? I must admit – I’m haven’t eaten a lot of sheep cheese. Before I ate this, I thought it would be a hard cheese with a lot of flavour. Not sure why I thought that, but from looking at it it looked hard and dense…so I just expected a hard texture and a strong flavour. How wrong I was! It was delicious! Not a strong flavour at all, very subtle in fact – so I just kept eating it (don’t think I demolished it all at once, but I easily could have done). It was really creamy, with a smooth and soft texture – absolutely wonderful. So as I said, the combination of flavour and texture meant that it was very moreish – this isn’t a cheese that will last you a long time. I ate it with crackers (sure I’ll write a separate post on crackers later). Probably could have gone with bread as well, but I tend to always eat cheese with crackers. I decided to try a chutney with this and what I’d say – don’t have this with any sort of chutney. Because the flavour is so subtle, any sort of chutney or pickle will overpower it. And you wouldn’t want to ruin the flavour of a cheese, would you? I wouldn’t even bother pairing it with grapes or any other sort of fruit. Or even wine. Wouldn’t be any good on a cheeseboard. Just enjoy the simplicity. As you can tell, I really enjoyed this cheese. I’d buy it again, and it’s got me wanting to try more sheep cheeses. Would recommend.